The state of social finance in Canada is rich and complex, but faces considerable challenges. 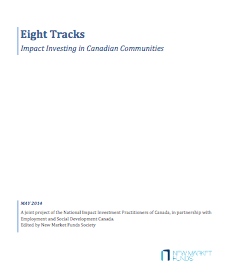 This compilation includes case studies of social finance investment funds (“SFIF”) from across Canada, focusing on the formation, capital raising and capital deployment of each individual SFIF. By having each SFIF tell its own story, the intention is to better understand the opportunities and challenges that SFIFs face in getting off the ground and in securing and deploying capital. Each case study represents a possible model that may help inform others when considering SFIF creation, development or transformation. Some of these models are born out of community experience, while others have been inspired by examples from outside of Canada. Now, thanks to these case studies, there is a compendium of some of the many and diverse Canadian SFIF models that currently exist. The target audiences of this publication are social financiers, developing and existing Canadian SFIFs, community and private foundations, community development groups, financial cooperatives, and all levels of government.